Palestinian rabbi of the seventeenth century. He was the father of Joseph ha-Levi and son-in-law of the Talmudist Abraham ibn Hananiah, rabbi of Hebron and pupil of Joseph di Trani. 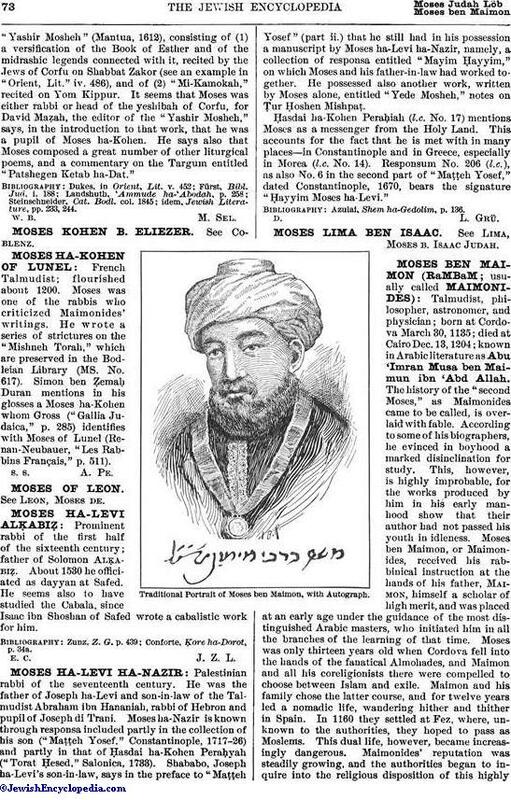 Moses ha-Nazir is known through responsa included partly in the collection of his son ("Maṭṭeh Yosef," Constantinople, 1717-26) and partly in that of Ḥasdai ha-Kohen Peraḥyah ("Torat Ḥesed," Salonica, 1733). Shababo, Joseph ha-Levi's son-in-law, says in the preface to "Maṭṭeh Yosef" (part ii.) that he still had in his possession a manuscript by Moses ha-Levi ha-Nazir, namely, a collection of responsa entitled "Mayim Ḥayyim," on which Moses and his father-in-law had worked together. He possessed also another work, written by Moses alone, entitled "Yede Mosheh," notes on Ṭur Ḥoshen Mishpaṭ. Ḥasdai ha-Kohen Peraḥiah (l.c. No. 17) mentions Moses as a messenger from the Holy Land. This accounts for the fact that he is met with in many places—in Constantinople and in Greece, especially in Morea (l.c. No. 14). Responsum No. 206 (l.c. ), as also No. 6 in the second part of "Maṭṭeh Yosef," dated Constantinople, 1670, bears the signature "Ḥayyim Moses ha-Levi." Azulai, Shem ha-Gedolim, p. 136.